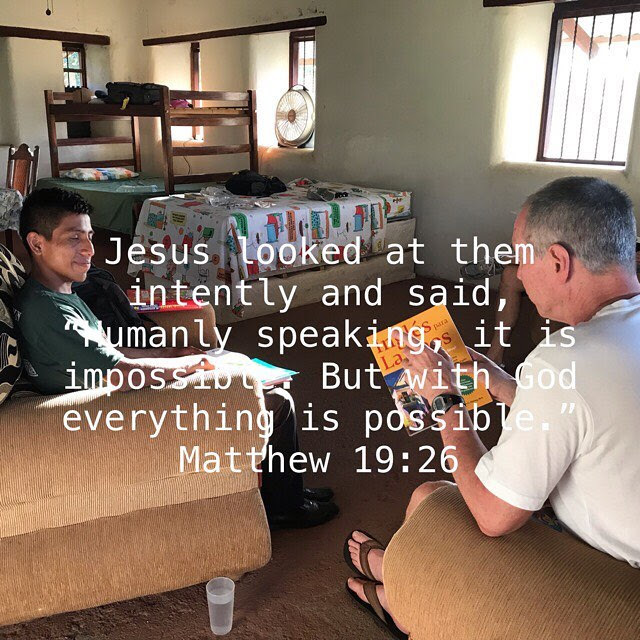 During my recent visit to Ometepe, we were invited to meet our local mission team at a young family’s house in Balgüe (See Christian’s Family video). It was in the middle of the afternoon and April in Nicaragua is the peak of the HOT, dry season. What I found astonished me. The entire 10-person team, PLUS Christian and her family, were moving giant rocks to form a drainage system in preparation for the rainy season. This was such an act of humility and servant hood beyond evangelism, modeling Jesus’ directive, I have given you an example, that you should do as I have done to you (John 13:15 NIV) to build up Christian’s home (literally) with love. It was the next day that the team received their new walking shoes, water bottles and ponchos from your generous donations. These vessels of Jesus were so grateful for your donation of supplies, especially the walking shoes. As I watched each of them try on their new shoes, I was overwhelmed with humility and the vision of Jesus washing their feet – just as He did on Maundy Thursday saying, Now that I, your Lord and Teacher, have washed your feet, you also should wash one another’s feet. (John 13:14 NIV). THANK YOU to all who made it possible to bless these people and metaphorically “wash another’s feet” (John 13:14 NIV). Wow Ometepe is all we can say since our return from Nicaragua on February 12. 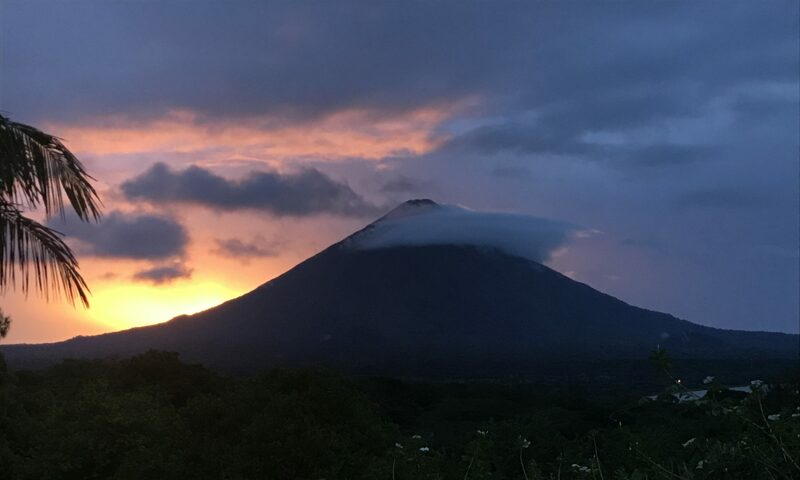 We were greatly encouraged by the continued stability of the nation since 2018’s civil & economic unrest – the biggest surprise was a strong return of tourism to Ometepe. There is still room for caution, but the situation has brought increased cooperation and partnership among the Nicaraguan people, churches and other ministries, including OBGM. This IS the body of Christ in action and it’s so good! Just as Paul, shares in Romans 12:5 SO IN CHRIST, WE WHO ARE MANY ARE ONE BODY, AND EACH MEMBER BELONGS TO ONE ANOTHER. Pre-owned 4-wheel drive truck for transportation of bulk nutrition supplies, materials, outreach team members, visiting team members and general needs. The vehicle must be purchased in Nicaragua. Thank you to Tom Davis of Grand Junction, CO for joining us in Nicaragua from February 2 – 12, 2019. The people of Ometepe were so blessed with his presence and contributions throughout his visit on the island. We especially appreciate Tom’s input with our children’s English school program, including lesson planning and materials given to our English teacher, Hilder. With 30+ years as a professional educator, his experience was invaluable and timely since the new school year in Nicaragua commenced February 4. Tom managed to have some fun, too! We squeezed in a waterfall hike and a fishing on two afternoons. Best, of all, he plans to return to Ometepe in the future with two his grown daughters and son-in-law! We look forward to his return and how each of his family members bless the beautiful people of Ometepe. ARE YOU INTERESTED IN SERVING WITH US THIS SUMMER IN NICARAGUA? CONTACT US FOR MORE INFO. Thank you Cocoa Beach Daybreak Rotary Club for the Toshiba laptop awarded to Lisbeth Issamar Bravo Garcia, age 19. Lisbeth is a deserving student attending her 3rd year at the University of Managua (UNAN) majoring in architecture. She was both humbled and thrilled with receipt of this assistance as she had NO computer to complete her upcoming coursework! She plans to graduate in 2021. Fully-functioning laptops and unlocked smartphones are in great need. If you would like to donate one of your own items, please contact us. Words can not describe the sight of 21 kids crammed into a classroom on a hot Saturday morning eager to learn English! The below video is from February 9th’s first day of school and celebration. We hope you can see the value and love this program brings to the children in Sintiope. Please consider helping us expand this program which helps the community seek better employment. BODIES: Your generosity helps to nourish ~ 80 bodies/month – many in some of the hard-to-reach communities and with family members who are very sick. One of the most humbling & educational moments during our visit was the time we spent with the local mission/outreach team from God’s Assembly church in Santa Cruz, Ometepe. This team of 10 dedicated volunteers go out into the “mission field” 2x/week from 5am – 6pm, seeking residents in under-served communities as far as 10km away from their homes. Many of those reached include the extremely sick and/or poor farmers who have no access to a church, bible study, healing prayer or simply in sharing in God’s word. In addition to a small travel stipend they receive from OBGM, the team hosts their own fundraisers to support their program. We are honored to have this dedicated team help us sort, weigh, pack and deliver food kits to those most in need. Each kit feeds a family of four (4) for 1.5 weeks, and on average 20 families receive the aid per month according to our current budget. But it’s not about the food. This is really about working together as the Body of Christ to share God’s relentless love…providing comfort, peace, healing, joy…all of the gifts available to us by His sheer grace. NEEDS – We need help outfitting each team member with appropriate walking shoes and rain ponchos during our next visit. To accomplish this, we’ve set up an Amazon Wish List with specific shoe sizes for each team member as well a link for the rain ponchos. If you chose to donate, please order before March 15 to ensure timely delivery to us, prior to our visit. Prices range from $15.99 – $41. These are the typical shoes our outreach team wear 5am-6pm walking miles, many times up steep hills & volcanic rock. Please consider helping us to acquire proper walking shoes for each member of these beautiful servants of Jesus. MINDS: 7 primary school students were fully sponsored last month to supply school uniforms, backpacks, shoes & supplies for the 2019 school year. Meet Prisila Rios from Santa Cruz, Ometepe Island. 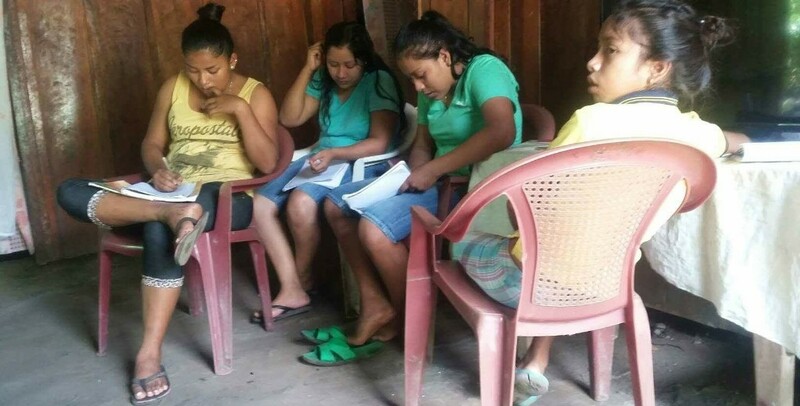 Prisila will assume a full course load of classes in Rivas, Nicaragua commencing this month. She will commute from Ometepe & attend classes on Saturdays. 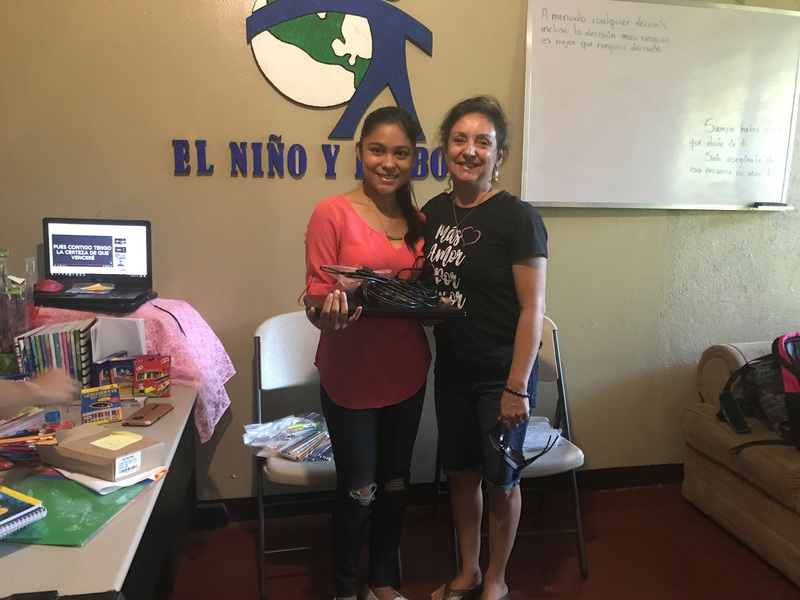 In addition to her other responsibilities, Prisila is a dedicated volunteer in her community in Santa Cruz, including serving on her church’s mission team twice per month. If you would like to sponsor a college student like Prisila, we are seeking financial support of $50 per month,or $500 per year per scholarship. When donating, please specify “college scholar” on the designation line. 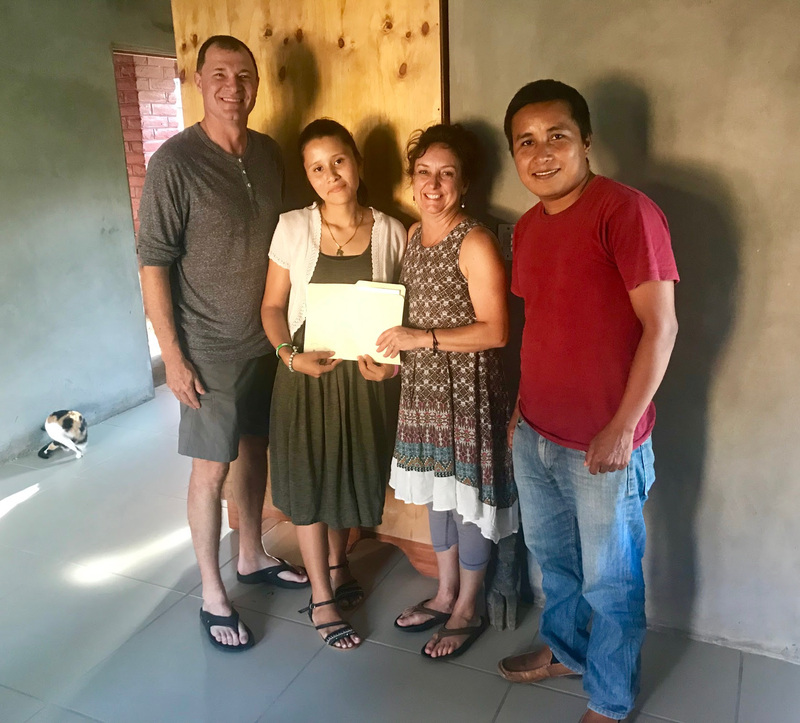 Congratulations to Denis and Hilder of Ometepe who completed Youth With a Mission’s (YWAM) two-week training program in Managua on January 31, 2019. The program, Save to Serve and Transform (SST), is specifically for young people who want to make God known with their lifestyle, families, community, nation and the world. This is accomplished through not only study and reflection, but also through outreach. Rochelle had the privilege of serving along side these two young men in an outreach day in the trash dumps near Managua. We are delighted to watch them transform and grow in their relationship with Jesus. We look forward to helping each of them continue in their journey and we ask for your prayers. “SO IN CHRIST, WE WHO ARE MANY ARE ONE BODY, AND EACH MEMBER BELONGS TO ONE ANOTHER” – ROMANS 12:5. We hope you all had a meaningful Christmas season and Happy New Year. Since we returned home from visiting family and friends in NJ & PA, it’s been nonstop planning for 2019. Rochelle leaves for Nicaragua on January 28th to prepare for our first visiting short-term missionary, Mr. Tom Davis, of Grand Junction, CO (see below), who arrives with T.J. from Feb 2 – 12. Scroll down for more details since December’s update. Please continue to pray with us and for travel safety as we team up with our partner ministries, friends and staff in Nicaragua. We will do our best to keep you updated via our Facebook Page, Instagram but sometimes online access is not consistently paired with our busy schedule in the field. Welcome Tom Davis!We are overjoyed to have Tom Davis of Grand Junction, CO join us in Nicaragua from February 2 – 12! Tom’s passion for youth and 30+ years in education will be a huge blessing to our ministry, especially with our English students and teaching staff. Tom currently works as an adjunct professor at Colorado Mesa University in Grand Junction,teaching education to prospective teachers.He also works in his church with middle school, high school and young adult age students. He holds Bachelor’s degrees in Theology and Education as well as a Master degree in Music Education. Tom has traveled the world and loves serving in missions. He has two adult daughters who also love serving the Lord. We can’t wait to see the impact of Tom’s contributions on Ometepe Island in February. BODIES: Your generosity helped to nourish ~1,100 bodies in 2018. The economic crisis is slowly improving, but food assistance and outreach to the elderly & sick is still needed in 2019. Can you help us? Thank you Cocoa Beach Daybreak Rotary Club for the Toshiba laptop donation for our scholarship program. The recipient is a female college student from the University of Managua majoring in architecture. Fully-functioning laptops and unlocked smartphones are in great need. If you would like to donate one of your own items, please contact us. MINDS: Thanks to your support in 2018, each and every one of our English class students will have their own textbook in 2019. Please pray for Denis and Hilder of Ometepe who will start Youth With a Mission’s (YWAM) two-week training program in Managua, commencing January 19. The program, Save to Serve and Transform (SST), is specifically for young people from ages 13 to 20 who want to know God and make him known with their lifestyle, families, community, nation and the world. We are delighted to invest in these young men and look forward to watching their relationship with Jesus grow and flourish for years to come! Stay tuned for more details as Rochelle will meet up with Denis and Hilder in Managua before the end of the month. Below are some images from the Santa Suitcase distribution in December. The art supplies and Barbies were a huge hit! We look forward to visiting with many of these children in February and hope to share more stories with your via our blog, Instagram and/or Facebook page. It is so amazing to see the Body of Christ working together to help fill & deliver Santa’s Suitcase! Last year I bought a citrus tree at a local nursery who assured me it bears fruit each year. I brought it home, replanted it in a large pot and placed it where I thought was the perfect location on our deck. A few months later, a few blossoms appeared. I was so excited, and my mouth salivated at the thought of our family eating organic citrus grown in our back yard. Weeks went by, and I noticed there was no new growth or fruit on the tree. What went wrong? Months passed and nothing happened. In fact, at times the tree was knocked over during strong summer storms. Remain in His Love & Joy! Eventually, I moved the tree to a new location which was closer to our home. This location received less Florida sun and was among other plants and shrubs residing in the earth. The tree needed to be around other life to help protect it. In this life, we need to trust God, our family and/or community when we are vulnerable. Whether we are the receiver or the giver of help, we need each other. Jesus knew this and commanded us to love our neighbor, and even our enemies, as ourselves. Like Jesus’ death and resurrection, the decomposing compost helped to yield the most beautiful blossoms and fruit on this tree. Thank you, Jesus, for your ultimate sacrifice, so we may blossom, bear fruit and remain in your love! I’m still reflecting on the interactions and images during my ten day visit to Nicaragua. One profound moment occurred on day two in Nueva Vida, as I sat beside a group of mothers and their very young children. One child, a little 2 year old boy, was playing with a dilapidated bicycle tied to a baby walker with a tattered rag. I think they were tied together to keep the boy close to his mom and infant siblings. The little boy was so happy playing with this bicycle. You could tell how much he cherished the bike by the care he was taking in handling the wheels and handle bars. It was precious to him, despite the fact that this bicycle had NO chain, NO seat and NO pedals. In fact, it was covered in rust and dirt. Yet this child adored the broken, pieces-missing, rusted-out shell of a bike. Through this child at that moment watching, I saw our loving Papa God. Our Father loves us just like this little boy loving on the bike. He loves us despite all of our rusted bits, missing parts, sins and imperfections. We are his precious children and he wants the best for us no matter how battered we are from our journey. He is a loving Father. He is a good Father. In fact, that love runs so deep, He sent His only Son to this earth to die for all of our messy sins. Wow! I am grateful to be His child. And hope you are too. My first few days in Nicaragua were spent with our friends from the Beauty for Ashes Project. This ministry shares the love of Jesus with children and families in the heaps of trash in the capital city of Managua. On the day we arrived, the group had plans to visit a family in a community called Nueva Vida to celebrate birthdays of three (3) children. I was honored to be invited to attend with the group. On our drive into the community, I was overwhelmed by the sheer size of the trash heaps alongside the unpaved roads. They were like mini-mountains of garbage, plastic and rubbish ranging approximately 8ft. to 15 ft. high. Each pile cascaded down to become part of the dirt road beneath the wheels of our truck. It was not your typical Main Street welcome. However, the real welcome came when we arrived at the home of Salva & Henri, their 11 children and 6 grandchildren. Salva, in particular, was filled with so much joy to see me. I briefly met Salva in April at an event in another town and I had forgotten about our encounter. The interaction in April, however, had meant so much to Salva. She almost squeezed the breath out of my lungs as she hugged me in Nueva Vida. It was such a surprise, and yet her Joy was so pure it brought me to tears! As we continued our greetings, Salva s hared her testimony of accepting Jesus fully into her heart and living in relationship with Him. The fruit of that intimacy was obvious in the joyful nature within her family as we spent the afternoon celebrating the birthdays and Jesus’ love. It did not matter where we were, how many flies swarmed the birthday cake or what smells occasionally floated by with a strong breeze. Nothing compares with Heaps of Joy, Love & Peace I found in Nueva Vida that first day! I want to be a cog! Do you? If you’re not sure of the definition of a cog (not the urban dictionary version), it’s the little piece that projects from the wheel of a gear. It is an integral part of the moving gear or wheal. It engages with all the other projections of the other wheels in motion. Cogs can be big or itty bitty. What made me appreciate cogs were two recent interactions with people I see as examples as Jesus in action. The first event was a sermon from my pastor, Mark Reynolds (click here to see why Pastor Mark’s sermon spoke to me). The second was a conversation with our beloved friend, Tom Fritz. Tom, his wife, Esther and their family have spent the last 30 years as missionaries in Central America. I can’t speak for Tom or Mark personally, but I can imagine there must have been seasons, where they felt that God’s purpose for them and their community was at a standstill. I have felt this way before. Have you? Well maybe it’s just that the cogs on the wheel are moving slower than our expectation, but the gears are still turning to His timing. Or, could it be that some of the cogs between the wheels have broken off, or worn down, because we allow situations in our lives (or the news) to distract us from serving a His purpose? I can only guess, but one thing I do know is that God IS on the move and it is through us, his little cogs! We can make a choice to not only accept Jesus into our hearts but also practice his teachings in our daily interactions with others. (1 Corinthians 12:12-27) It can be as simple as a smile to a stranger, being more patient/forgiving with others – especially ourselves, or finding more gratitude in your daily life (Matthew 5: 5-7). I suspect God loves the tiniest and most diverse acts of kindness and compassion. How fast would you like to see God moving in our world and in your life? I invite you to take the “Cog Challenge” (Luke 10:25-27) to make this world a better place. Will you be a little cog with me? The rewards will be amazing! Which path shall I take? – In this calling that God put in our hearts, we recently struggled with whether or not, when, and how we are to visit Nicaragua in the face of the current political crisis. Questions arise such as: Will I be safe? What about my kids if something should happen to me? and What if … (fill in the blanks)? low in Jesus’ footsteps and walk in love, forgiveness, mercy & peace? How could we not trust in Him? As a result, the decision was made for Rochelle to visit Nicaragua from October 23 – November 1, 2018. Feeding Project — we plan to conduct another food distribution in the coming weeks. So far, your support has impacted 60+ families in four (4) towns. Financial support is most needed for this initiative. Any gift amount will make a huge impact. If you wish to participate but live far, email Rochelle to make arrangements. If you live in the Cocoa Beach area, we encourage you visit FUMCCB where ALL are welcome! We’ve added a third English session for young adults in the village of Sintiope. Our first is a children’s class that meets each Saturday in Sintiope. The second is an young adult evening session in Urbaite. This third class consists of five young adult girls who meet in a home – until it grows large enough for classroom space. This is very exciting news, as Hilder is not only a gifted English teacher, but a passionate messenger of Jesus. We are delighted to support this initiative and a young man of honor within his community. Do you have an old Smartphone? There’s still room in Rochelle’s backpack to squeeze a few more used UNLOCKED smartphones & chargers to take to Nicaragua. Email us to make arrangements.